"I'm Just a Kid From Brooklyn"
DO NOT READ IF YOU PLAN ON SEEING THE "CAPTAIN AMERICA: THE FIRST AVENGER"
The Cosmic Cube! Bucky Barnes! The Red Skull! Zola! The Howling Commandos! Doctor Erskine! The original shield and helmet! Cap on a motorcycle, packing a gun! References to the 1940s serial! Whoa!! I've only been waiting for this movie for most of my life, ever since my Dad bought me my first-ever comic book, the treasury edition-sized "Captain America's Bicentennial Battles." Although I would go on to become a more generalized comic book geek (though heavily Marvel-skewed), Captain America was always my favorite, my hero, the one I most wanted to be. Like the kid shown at the end of the new movie I, too, ran around clasping a metal garbage can-top as my shield, pretrending to be the shield-slinger himself. I enlisted childhood friends to assume the role of the ill-fated Bucky Barnes (obsessed as I was, even then, with back-stories and tragedy) as we prowled the neighborhood, looking for supervillains. In wintertime, I traded in the garbage pail top for one of those disc-shaped sleds known as flying saucers, and pratciced hurling it around at trees and posts, stand-ins for the Nazis and evildoers in my imagination. I made my friends call me "Cap." Why? What was it about Captain America that thrilled me? Phil Satlof, bass player for the late Tuscadero and one of my oldest friends (we met in kindergarden) asked me that question a few weeks ago in the midst of the pre-release hype for the new movie. "Why Captain America? ", he wondered. "What was it about that jingoistic crap that you were so into?" It was a good question, and I ruminated on it a bit while watching the film. It's not that I am Mr. Patriot. I have a lot of problems with the state of our country today, and the way we do things here. If you've heard "The Farmer's Song" from "No Further Instructions," you know where I'm coming from. Captain America was my hero for a number of reasons. It wasn't just his beginnings as a scrawny kid who was always getting picked on (a ubiquitous ingredient in origin stories throughout comics, see: Peter Parker, Bruce Banner, Tony Stark, Donald Blake, Matt Murdock, ad infinitum). I liked that he really didn't have super powers, relying instead on his intelligence, dexterity and physical training. He was kind of like the Marvel version of Batman in this way, without the psychosis or the weird gimmicks. I liked that he was one of the few Marvel carry-overs from The Golden Age, and that he was once again (at the time) being written and drawn by one of his creators, nearly forty years after his first appearance. 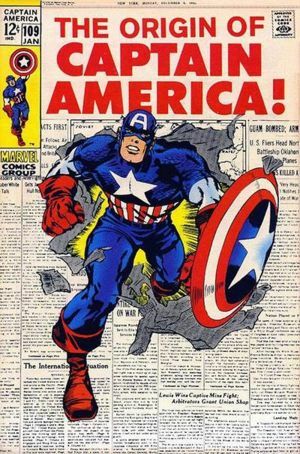 Bob Kane had long since left Batman, Siegel and Schuster were decades removed from Superman, but the great Jack "King" Kirby was once again at the helm of Captain America, and that lent the comic real authenticity to me. I liked that he had some pathos to his story, carrying with him the survivor's guilt of having outlived his sidekick Bucky and also the confusion and mild shizophrenia that came from being asleep for twenty years -- a man out of time. Most of all, though, I think I liked that Captain America had real dignity -- a sort of unassailable, old world, old fashioned fairness about him, perhaps owing to his membership in an earlier generation. He had the respect of his peers. He was a natural leader. He wasn't a loudmouth or a show-off, never sought praise or glory, just did his job, did it well, and left the spotlight to others. If he were a baseball player, he'd be Lou Gehrig. In the new movie, his alter ego Steve Rogers is asked why he's so willing to undertake the great risks involved in the Captain America experiment. "I hate bullies," he says. 'Nuff said...that's Captain America, in a nutshell. He battled unfairness, without the aid of supernatural powers (i.e. Superman, Spider Man) or campy gadgetry (Batman, Iron Man). If one were smart enough, skilled enough, honest enough, and dedicated enough, it always seemed possible that one could grow up to be Captain America. And when, in the new movie, he says "I'm just a kid from Brooklyn," the words resonated with that part of me that still believes that to be true. Are there flaws in the film? Sure. Chris Evans doesn't radiate the gravitas needed for the part (here's hoping he grows into it as the franchise continues). The Red Skull bears an uncomfortable resemblance to Jim Carey's The Mask, and is -- alas -- not much more frightening. In terms of the story arc of the film, it feels too heavily-weighted on the origin tale; Captain America has barely even gotten into action, it seems, before he's caught in the accident that will put him on ice and effectively end his Golden Age career (and, so, the film). And if you're going to go so far as to give us Bucky (again, Bucky -- hooray! ), couldn't you have at least put him in costume for a scene or two? Still, these are minor quibbles. Captain America is hugely rewarding for longtime fans like me. It just gets so many things right, from the muted color palatte to the steampunk costume elements, to the fealty to so much of the original comic book continuity (even improving on the latter in at least one instance -- the revisionist costume origin is an inspired stroke of genius). I mean, c'mon -- the last wide-release attempt at a live action Captain America movie was the 1979 made for TV movie with the transparent shield and the CHIPs-style motorcycle helmet, an attempt so ill-conceived I think I cried when it aired. Next to that, the new movie is Citizen freaking Kane. So there, I've officially outed myself as a comic book freak (and you don't know the half of it). Maybe I'll write and record a superhero song cycle one of these days. And, hey Marvel -- if Bono and the Edge are busy and you need a composer for the Captain America musical -- I'm your guy.